In a clinical study of more than 400 women, 8 out of 10 women who used Women’s Rogaine Foam regrew thicker hair, with clinical results in as early as 12 weeks. The new Women’s Rogaine formulation contains 5% minoxidil. Minoxidil is thought to act at the level of the hair follicle, possibly directly stimulating hair follicle epithelial growth. It may induce follicle hypertrophy and a return to more normal hair follicle diameter and depth in existing small follicles (eg, regrowth) rather than stimulation of new follicle formation. Women’s Rogaine 5% Minoxidil Topical Aerosol, penetrates into the scalp, with gentle massaging to reactivate hair follicles and stimulate hair regrowth. Clinical studies show that with once daily use of Women’s Rogaine 5% Minoxidil Topical Aerosol for 24 weeks, 81 percent of women regrew hair, with initial results as early as 12 weeks and new hairs coming in up to 48 percent thicker than before. To apply, simply dispense the product onto a non-porous surface, part hair to help maximize scalp exposure and massage it into the scalp and allow to dry. Women’s Rogaine 5% Minoxidil Topical Aerosol can be applied to dry or towel dried hair; followed with the styling product(s) of choice. The product can be used on colored or chemically-treated hair, but should not be used on the same day of any chemical treatment to the hair. Continued use of Women’s Rogaine 5% Minoxidil Topical Aerosol is required to maintain results. Women’s Rogaine 5% Minoxidil Topical Aerosol is available nationwide without a prescription in November 2014 and has a suggested retail price of $29.99 for a 2-month supply and $49.99 for a 4-month supply. 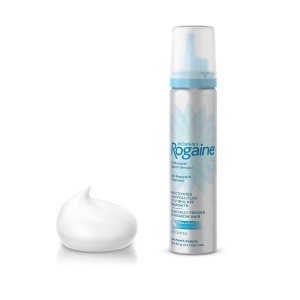 Women’s Rogaine foam 5% Minoxidil Topical Aerosol is available over-the-counter in 2-month (one 60g can) and 4-month (two 60g cans) supply packages. Women’s Rogaine Foam Topical Solution contains minoxidil, the first FDA-approved ingredient clinically proven to help regrow hair. The solution penetrates into the scalp to stimulate shrunken hair follicles, allowing hair to develop over time. Just apply twice a day as part of your regular beauty regimen. #1 brand most recommended by dermatologists. 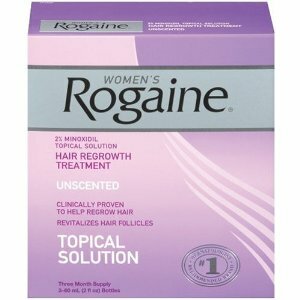 Women’s Rogaine is for women who have a general thinning of hair on the top of the scalp as shown. Women’s Rogaine has been shown to regrow hair in women with the following degrees of thinning hair or hair loss. FDA approved hair loss treatment for women with 2% Minoxidil. It takes time to regrow hair. You may need to use Rogaine for Women twice daily for at least 4 months before you see results. Continued use for up to 8 months may be required to see your own results. Apply 1ml with dropper or sprayer (6 sprays) 2 times a day directly onto the scalp in the hair loss area. Using more or more often will not improve results.